We are Aluminum Die Casting manufacturer in China for many years. 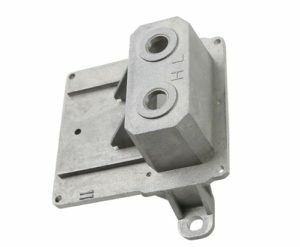 Die casting can produce complex shape, clear outline, thin-walled deep cavity metal parts: because of the molten metal under high pressure high speed Maintain a high liquidity,Therefore can obtain other process method is difficult to machining metal parts. This part is used as a machine spare part. It is being selling in Europe. Die casting:Aluminum & Aluminum alloy A360, A380, A390, ADC12,ADC10,ALSI09 etc..
weight According to your sample or drawings. Surface Treatment Sand blasting,Zinc/chrome plating,Powder coating, Anodizing,Polishing,electrophoresis,Plating chrome, Plating nickel, Plating zinc,Passivation,Anodize etc..
-Send us enquiry by either email or fax, and we will send you detailed offer. -After everything is confirmed, we will send you a Proforma invoice in which the trading terms is included. -We will arrange production after receipt the deposit. -We make sample to you before mass production for your confirmation. -We start production after sample confirmed.